I do believe I've found my favorite graphic novel of the year, so far. I'm sure you all know that I love fairy tales. If you've been following me for any length of time, that should be evident. What you might not know though, is that my favorite fairy tales (especially as a child) were the creepy ones. The unsettling ones. The ones that dealt with all the things that lurked in the dark. 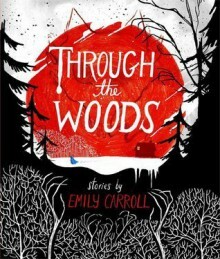 Which is why Emily Carroll's Through The Woods has my heart, forever and always. 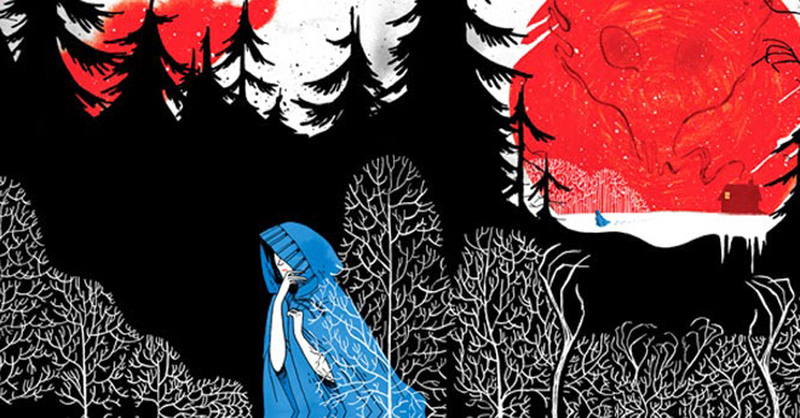 These five stories aren't so much terrifying, as they are wholly unsettling. They creep in under your skin, and send shivers up your spine. It's beautiful how simplistic, and how short, all of these are. And yet, they manage to push across more atmosphere and depth than a lot of what I've read lately. A lot of that has to do with the art. Oh, that sumptuous art. I had to include an example below, because it's just too good not to share. Again, it's simplistic. Yet, it's also not. The color palettes aren't varied too much, there's no stark definition, but each panel goes perfectly with the story that it's telling. One of my favorite panels was in "A Lady's Cold Hands". Our narrator talks of how cold and unfeeling her new husband is, and there's this panel where it slowly zooms in on him devouring bloody meat with his teeth. Are they really sharp? Is it your imagination? I leave that up to you. This was brilliant! Gorgeous, gripping, and compulsively readable. I'm buying this in physical format as soon as possible, because I feel like it deserves to be shared.